Indie remakes and homages to classic retro games don’t always capture the same thrills as the originals – see the huge number of bad 2D platformers released in the last 5-years – but sometimes they’ll strike gold again and come up with something just as good, if not better, than what they were inspired by. Case in point is Ultratron, a twin stick shooter lovingly crafted in the image of the beloved Robotron 2084. Ultratron takes the basic concept of Robotron but kicks up the gameplay and introduces a great upgrade system that adds some much needed variety to the experience. Ultratron is a fresh take on a classic for the modern era, and is a total blast to play. See our review for details. 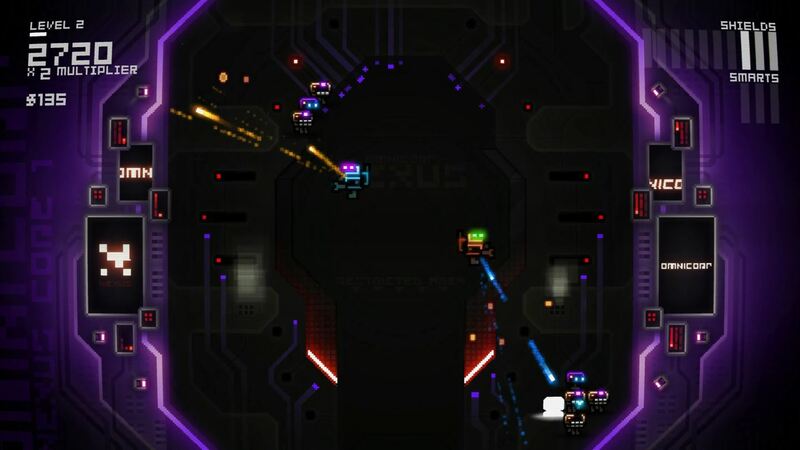 Ultratron is a 2D twin stick shooter where you blast your way through waves of enemy robots that spawn into the arena. The enemies start out as mostly easy targets, but new enemy types are quickly added that can shoot back, place bombs, take many more hits to kill, and more. Every few levels there is also a boss fight against a giant enemy robot where you have to shoot off various components to kill it. The game has a nice difficulty curve that introduces things at a fairly even pace to allow you to adjust as more enemies appear and enemy types are added in each round. What sets Ultratron apart from Robotron or many other entries in the genre is the fascinating upgrade mechanic between each round. You pick up money from all of the enemy robots you defeat, which you can then spend on new upgrades. 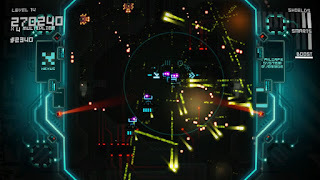 You aren’t just getting more powerful with the upgrades, though, as you also have to re-supply your shields and smart bombs between rounds as well. This creates interesting strategic choices as you have to decide whether to buy new shields or increase the power on your weapons. Or maybe you should buy some little robot buddies to follow you around like options in a shmups. Or a stronger magnetic pull so you pick up money from further away. Or a turret. Or a number of other upgrades. All of these options add a ton of variety to the game and give it a fantastic strategic element many twin stick games lack. When you put all of this together, Ultratron is a total blast to play. The controls are responsive – really it’s just move and shoot on the sticks and pull the trigger for bombs - and the game feels great to play. Things get even more fun when you add in another player in co-op. My only real complaint is that it can sometimes be hard to see what is going on. 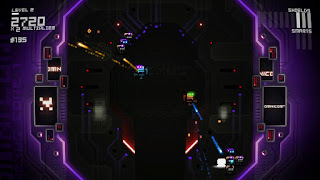 The game is very appealing looking with a dark playfield highlighted by bright neon colors, but the enemy robots and backgarounds both use the same colors in each level so it can be hard to distinguish enemies from the background. 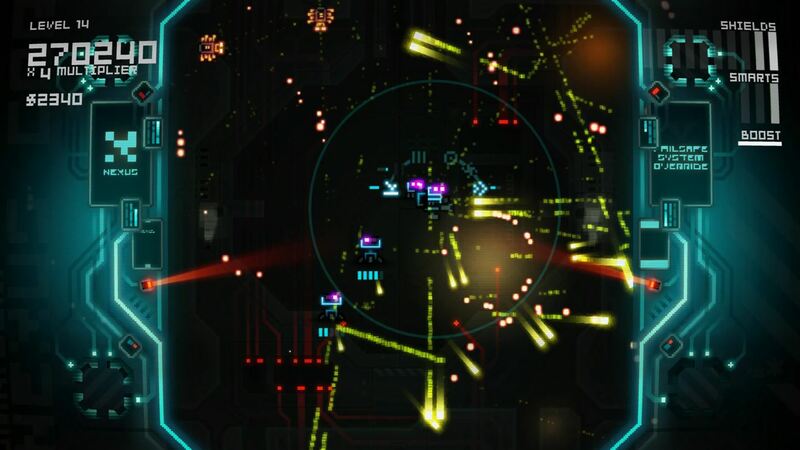 The screen can also become filled with bullets and explosions and enemies and it can be hard to see where you are and what is going on. I love the way the game looks, but more could have been done to make it easier to see. All in all, Ultratron is a pretty spectacular upgrade to an arcade classic. It plays great and looks really, really cool, and the upgrade system gives it a surprising amount of depth. At just $10 it won’t break the bank, either. If you’re a fan of twin stick shooters, and particularly if you want to play co-op, give Ultratron a try.